The Okinawa Aquarium is massive. But maybe that’s because I haven’t been to an aquarium in a long time. It’s several times bigger than the Pineapple Park and 100 times more interesting. From Naha, it’s a long drive North. Public transportation, again, is not the best option. If you really want to go, I highly recommend driving or taking a tour. Officially, it’s the Okinawa Churaumi Aquarium, but it’s the only place known as “The Aquarium.” It was a hot and humid day of 29C (85F). I know that’s not very hot by LA standards, but in full humidity it feels like it’s over 100F. It’s the type of heat that just causes your body to sweat if you’re outside (in the shade). Nevertheless, the Okinawa Aquarium was busy with lots of people (they were probably timing the dolphin show too). Before even getting into the actual aquarium, you’ll run into a gift shop. If you wanted to pick up some A1 sauce while you were there for some reason, don’t worry, it’s in stock. And as you walk around the park you’ll run into this guy a few times. 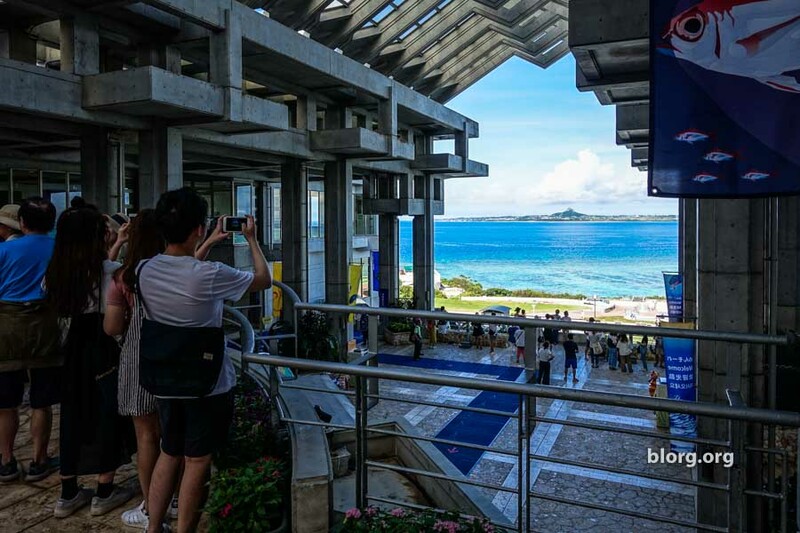 At the actual entrance to the Okinawa Aquarium, you’ll be able to buy tickets and they’ll take a photo of you for free. The free photo of you will go on a tiny calendar that you can pick up at the gift shop at the exit of the aquarium. You’ll also be able to purchase a full size photo for a reasonable fee. To get to that gift shop, you’ll have to power your way through one amazing aquarium. I really wanted to see the dolphin show so I had to speed view the aquarium. The main highlight that our tour guide told us was the dolphin show. The Okinawa Aquarium has a dolphin show on par, or dare I say, even better than Sea World. But those dolphins deFINitely (get it, FIN!) need to work on their singing. They got the lyrics right but their pitch was all over the place.